SW England Seasonal Forecast December 2015 to May 2016 – published 16 November 2015. The cold sea temperature anomaly in the North Atlantic remains although seems to be changing in shape and coldness of the anomaly may be reducing. Long range models predict a cold anomaly is likely to last well into 2016. The El Nino shown clearly in the Pacific. The nino3.4 area is predicted by models to change to neutral conditions in mid 2016. Statistical rainfall probabilities during El Nino. Models consistent in suggesting enhanced jet (upper winds) over and towards UK during winter 2015/16 also some agreement that the Atlantic upper flow may be veered compared to normal – more westerly than southwest on average. This is illustrated by comparison between NMME output at 200hPa and climatology of 250hPa winds. 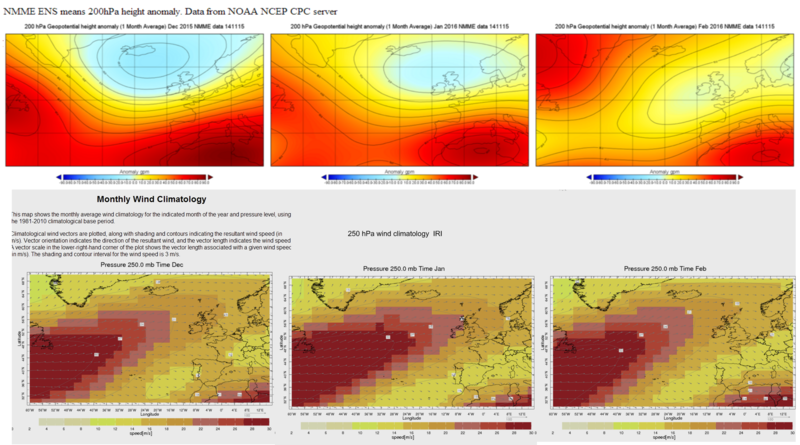 NMME 200 hPa anomaly forecast and 250 hPa 1981-2010 climatology. Sea level pressure anomalies also suggest that low pressure more likely across and to the N and E of UK than High pressure. The forecast for a “typical winter” for SW England with plenty of rain and not much snow remains the most likely overall outcome. This has been consistent over recent months long-range model output. Possibly the main snow risk is in February, chiefly over the hills and moors. There is no strong indication from the models for an unusually cold winter although February may see temperatures near or below normal. There may be less frequent low pressures crossing Atlantic towards UK from around the middle period of January compared to the very unsettled start of winter, although low pressure types are more likely to continue predominate than high pressure. This suggests that the main risk of wind storms is in the first half of winter. Low pressure tracks across the UK may lead to increased frequency of NW or N winds later in the winter. Mean temperature probably near or a little above normal in December and early January, though still with a risk of slightly lower than average values in western areas at least by day. Temperatures in the remainder of January and for February near normal, rather than above, but possibly turning colder than normal for February although this is quite uncertain in SW England but more likely further north. (Typical winter average 1981-2010 values for lowland areas 7°C in the West and 5°C in the East). Precipitation probably above normal in many areas to start winter but nearer normal later in winter, hence overall above normal for the winter period. (Dec and Jan typically wetter than February in any case. 1981-2010 Autumn average 300-400 mm lowlands but 200-300 mm areas to E of Dartmoor). Snow risk near normal (climatology less than 5 days lying snow over lowland areas 5 to 10 hills, say hills around 200 metre elevation – one in three years have no lying snow). Number of snow lying days over moors near normal overall but less than normal in December and perhaps much of January but possibly more than normal in February. There is less of a suggestion of a colder than average start to Spring in recent model output but hints that April may see below normal values. This makes the season as a whole near normal or slightly milder than normal. Precipitation indications are quite mixed but near or above normal overall seems the most likely. There continues to be some indication of above normal precipitation in March and below normal rainfall in May. Model forecasts have moved towards the statistical relationship between El Nino and a wetter than normal Spring across parts of SW England. 250hPa wind climatology source IRI maproom.